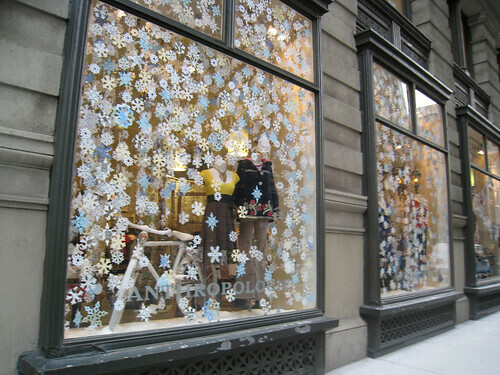 I took these photos last year at the Anthropologie store near Union Square in New York. I love paper snowflakes. In college I remember covering the windows of my whole apartment with them. I think I kept them up till I moved out! 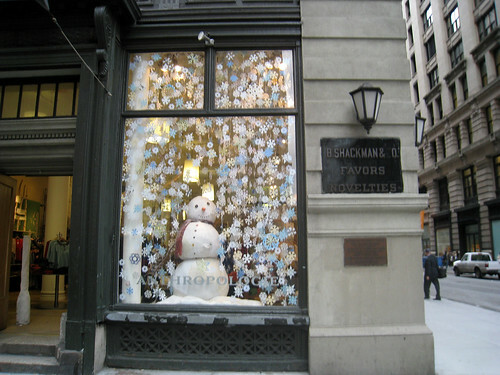 Some of the snowflakes were on the windows and some were hung on clear fishing line like a garland. Were the snowflakes glued to the window or hanging inside from above? I love that new/old memory look and am fast becoming a fan of Anthropologie. I've used double-sided tape. You might be able to use some type of spray mount. Available at craft stores like Michael's. You might be able to find pre-cut snowflakes there too! I would test any glue on your windows first to see if you can wipe it clean. What kind of adhesive would you suggest using? Do you know if anyone sells pre-cut snowflakes like this? Thanks.